The first week of training camp is underway for the Vikings and Stefon Diggs still hasn&apos;t been signed to a long-term contract extension. Diggs, 24, is entering the final year of his rookie deal after being selected in the fifth round of the 2015 draft. Barring a major injury, there&apos;s no doubt that Diggs will be paid big money if he&apos;s allowed to reach free agency, but Diggs sounds like he&apos;d prefer it doesn&apos;t reach that point. “I want to be here," Diggs said Sunday. “I love being here. I love being a part of this organization. They took a chance on me, so I love it here. As far as where we’re at, you kind of got to take it up with the right people. I haven’t spent too much time up there. But hopefully we can get some things done and we’ll see how it goes." Diggs made $615,000 last season and is due to make $1.9 million this season, which is well below what some of the other top receivers in the league are making. In fact, 80 wide receivers are due to make more money than Diggs this season, according to OverTheCap.com. In the NFL money world, Diggs is essentially the victim of being a late draft pick. But his numbers say he should be getting paid a lot more. Diggs played 14 regular season games last season and finished with 64 receptions for 849 yards and eight touchdowns, and then he added 14 catches for 207 yards and the "Minneapolis Miracle" in two postseason games. Vikings play-by-play voice Paul Allen recently told a Sioux Falls radio station that he doesn&apos;t think Diggs or Anthony Barr, who is also entering the final year of his rookie contract, will sign extensions before the season begins. 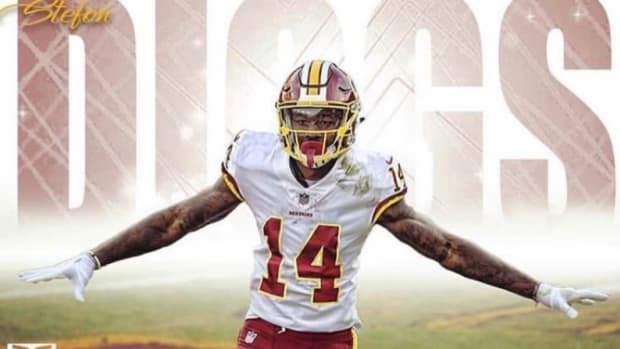 His brother posted a picture of Diggs in a Redskins uniform. Diggs is due to become a free agent after next season.